This is my own version of the deli scene from When Harry Met Sally. The setting is outside a coffee shop and instead of eating sandwiches, Harry and Sally are enjoying some coffee. Because I am in school for a film degree, it is only natural that I will make a few short films. This is one that I wrote, directed, filmed and edited. It is an artistic film about the transformation a young woman goes through during a bath after a very rough day. >The Michael Jackson I never knew. Tonight was a night that I have been waiting over a month for. 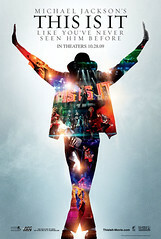 With tickets in hand I joined my parents as we entered the theater to see Michael Jackson‘s This Is It. To say that the movie was awesome would somehow be selling it short because This Is It is more than just a film or even a documentary. This Is It represents something more akin to viewing the most recent pictures or home movies of a family member or friend who has recently passed away. My feelings while experiencing this event-because that is what it really is-were not unlike the feelings I have when I see pictures of my grandfather that were taken months before his passing. The difference being that some of the footage used to make This Is It was taken weeks,days;perhaps even hours before Michael’s death. Here was a side of Michael Jackson I never knew. I watched in amazement as an undeniably healthy Michael rehearsed and perfected a show that would have been beyond anything I would have expected. He danced and sang with so much energy that much of the time I forgot he was fifty years old. Michael knew his music so well that it seemed to emanate from him. Like the music was an extension of the man. Nothing could impress me more than to see the man whose music and influence have worked into my very soul, do what he did best and do it effortlessly. I swear that the dancers he chose worked harder to keep up with Michael than he did to glide across the stage. This Is It brings to our attention the truth of Michael Jackson’s last days on Earth. He was at the top of his game, ready for the comeback of a lifetime. That chance was taken away the moment he was killed. My heart hurts once again as I grieve once more for the passing of a mentor who never knew how special he was to me. At least now I know from seeing This Is It how much it meant to Michael to heal the world through music and how special all those who love him were to him.